Ernie Bicknell was born in 1904 at home in New Tupton. He started his 18 year career in the Tin Tab Gymnasium, Edlington at the age of 14,retiring in 1938 with 2 cauliflower ears and a host of memories. Ernie fought in the region of 550 contests winning approximately 450 of them, fighting at flyweight and later featherweight. One of his trainers was the ex British middleweight champion, Roland Todd, of whom Ernie said "It was almost impossible to hit him". and winning the Crystal Palace Featherweight Gold Belt and a �200.00 purse in 1928 beating Jim Collett on points. After hanging up his gloves he continued with his other interest, football, training local teams. He was also a Scout for Wolves introducing among others his son Roy as a player. 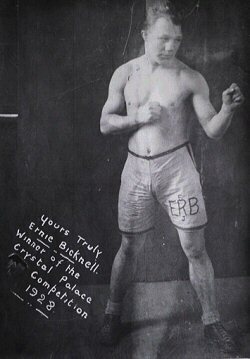 Thanks to Gabrielle Bicknell for kindly providing this information & great photo of Ernie.